View our guided rock climbing rates and book today! Or, call 888-CLIMB-ON. 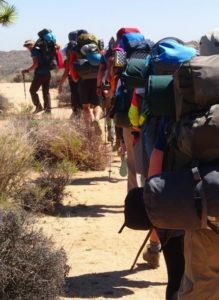 Uprising Adventure guides are certified Merit Badge Counselors for Boys and Girls rock climbing merit badges and electives. Bring your troop out for a day of learning and adventure! Reservations and tour permits are required for all programs. 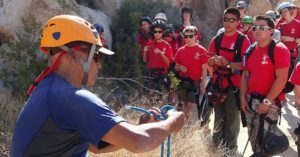 Prerequisite: Scouts have read the rock climbing merit badge requirements and have practiced three knots; figure eight/figure eight follow through, fisherman’s and water knot. For inquiries, rates or to book your youth group today, call 888-CLIMB-ON. 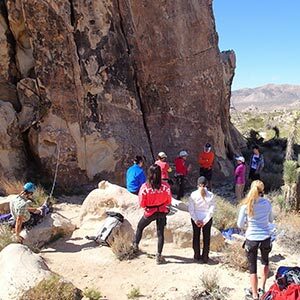 Rock Climbing is a natural team building exercise and an exceptional way for your team to build trust and confidence while overcoming challenges. Best of all, it’s fun! Uprising has been providing corporate team building events since 1996. We have hosted companies of every size from small privately owned companies to Fortune 500 companies such as IBM, Allstate and Wells Fargo. Uprising customizes your experience based on the needs of your group and the needs of each individual participant. 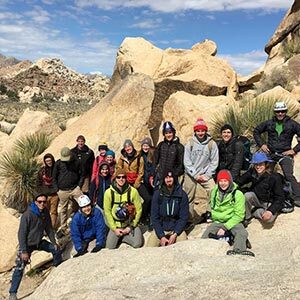 Our AMGA Certified facilitators will guide your group through the adventure of a lifetime while teaching trust and communication in ways you never thought possible. We offer year-round courses for individuals, groups and families. 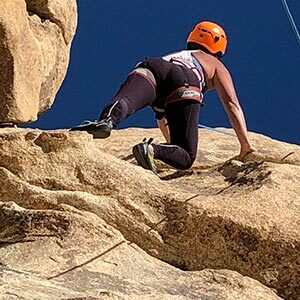 Private guiding is also offered at anytime, please call 888-CLIMB-ON for details on customizing your special climbing event. VIEW RATES & BOOK TODAY!